This review highlights the increasing incidence of breast cancer world-wide and the increasing burden of breast cancer deaths experienced by lower-income countries. The causes of increasing incidence have been attributed to changes in the prevalence of reproductive risk factors, lifestyle changes, and genetic and biological differences between ethnic and racial groups. All these factors may contribute, but data linking etiological factors to increased risk in developing countries is lacking. The challenge for lower-income countries is developing effective strategies to reverse the trend of increasing mortality. Down-staging of breast cancer by early detection is a promising long-term strategy for preventing disease-related deaths but it is difficult to make the economic investment required to carry out broad screening programs. Successful strategies for addressing the growing breast cancer burden will therefore take political will, reliable data, public and medical community awareness, and partnerships between community advocates, governments, non-governmental organizations and biotechnology. Breast cancer is the most common cancer of women in the United States and affluent European countries.1 Low- and middle-resource countries have historically reported lower rates of breast cancer than high-resource countries. However, over the past twenty to thirty years, data support a trend of increasing incidence and mortality from breast cancer in lower resource countries. Of the over million new cases of breast cancer that will be diagnosed worldwide in 2009, low- and middle-resource countries will be burdened with 45% of breast cancer cases and 55% of breast cancer-related deaths.2-4 This review will highlight the challenges presented by the global increase in breast cancer incidence and mortality and discuss some of the current thinking about reasons for this increase and approaches to address the rising mortality from breast cancer in low and middle income countries. It should be noted at the outset of any discussion of global trends in cancer that the limited data available for many countries is a hindrance to truly understanding the complexity of the global breast cancer burden. Incidence figures are based on data from small geographic areas that are often pooled and extrapolated to large regions. Reported rates may reflect only the women who are easiest to reach or who have the highest standard of living. Thus, current global figures cannot truly reflect the underlying economic and cultural diversity driving increased incidence and related mortality. In affluent Western countries, women have relatively high social status, delay childbearing, have relatively few children and, until recently, commonly used hormone-replacement therapy. These reproductive risk factors, which are primarily associated with an increased risk of postmenopausal breast cancer, are postulated as the reason for the higher rates of post-menopausal breast cancer seen in high resource countries compared with lower resource countries.4 What is still unclear is the relationship of these reproductive risk factors to increasing incidence rates in younger women in developing countries. Many countries with rapidly increasing rates of breast cancer, including Asian and Latin American countries, report an earlier peak of breast cancer than Western countries.4 In Hong Kong, a recent study found that the percentage of Chinese women with breast cancer younger than 40 years old was 17.6 (compared with around 6% in US Caucasians) and that the mean age at menarche was lower and the age at first live birth was higher in Chinese women under age 40 compared with Chinese women over age 40.14 As has been reported in U.S. women, the younger Chinese women presented with more advanced disease and more aggressive tumor characteristics than the older Chinese women.14 It is becoming increasingly important to understand how breast cancer in young women is influenced by the accepted reproductive risk factors and determine if there are other more relevant risk factors that may be related to breast cancer incidence in countries with rapidly increasing rates in young women. Even though the risks associated with diet, obesity, and exercise are not consistent between studies in the US and Europe, these factors are often cited as the cause of the increasing breast-cancer rates in developing countries. Migration studies that have revealed increases in breast-cancer incidence following migration from low-incidence countries to higher-incidence countries support the role of lifestyle changes in altering breast cancer risk, but it is difficult to pinpoint the individual contributing factors.15 High fat intake, low vegetable intake, and low soy intake have all been implicated, but the data have not been consistent or conclusive. In one of the largest nutritional studies of women in Shanghai China, an aggregate "meat-sweet" diet was associated with only a modest increased risk of breast cancer compared with a more traditional vegetable-rich diet.16 Risk of postmenopausal (but not premenopausal) breast cancer is increased among obese women, and physical exercise probably decreases the risk of postmenopausal breast cancer.17 Early age at menarche, another important reproductive risk factor for breast cancer, is associated with higher caloric intake, exercise and body mass profile and it is apparent that a trend toward decreasing age at menarche will affect breast cancer rates in lower-resource countries as diet and exercise patterns change.18-20 It will be important to understand these early life habits to completely understand the underlying causes of world-wide increasing breast cancer incidence. 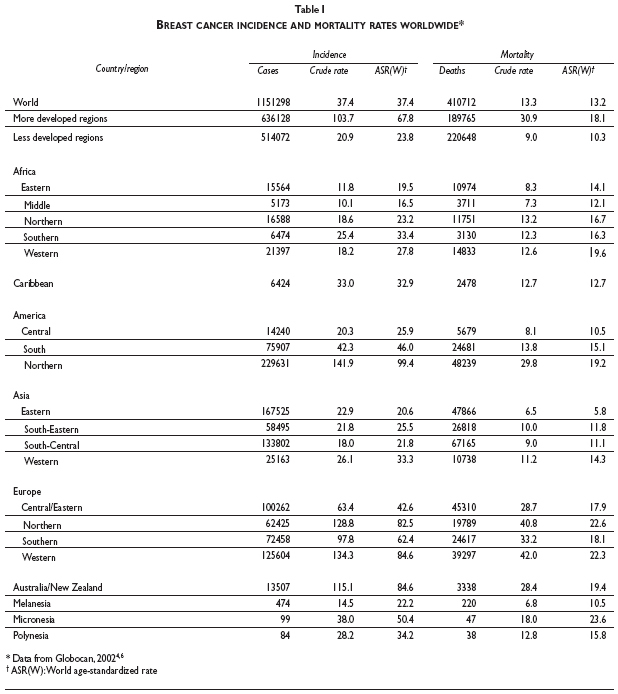 The worldwide ASR for mortality from breast cancer between 1993 to 2001 was 13.2 per 100000, ranging from 8.8 in Asia to 19.7 in Europe.4 The rate in 'more developed' countries was 18.1 compared with 10.4 in 'less developed' countries (Table I). The higher overall mortality rate in high resource countries reflects the high incidence of the disease in many of those countries. However, the burden of deaths due to breast cancer in lower resource countries is disproportionately high. Although the ratio of the mortality rate to incidence rate (MR:IR) world-wide is 0.35, it varies widely and ranges from a high of 0.69 in Africa to a low of 0.19 in North America. High mortality rates in low resource countries are primarily due to late-stage disease presentation. For example, the high MR:IR ratio in Africa to a large degree reflects the high proportion of women in many African countries who present with late-stage cancer. In sub-Saharan African countries, small studies indicate that up to 90% of women present with stage III or VI disease, many with large tumors (median of 10 cm) and clinically apparent lymph node metastases.21 These late-stage tumors can not be treated successfully in the most optimal setting. Inadequate health care systems also contribute to high mortality rates. There are no examples of universal breast cancer screening in low resource countries that could down-stage breast cancer diagnoses. In addition, there are typically only a few hospitals that can administer radiotherapy and chemotherapy and very few trained oncologists (Nigeria, for instance, has approximately 100 oncologists for a population of 140 million).5 National expenditure on health care overall inversely correlates with mortality from breast cancer, but there are exceptions.5 In Cuba, health expenditure is only moderate but mortality remains lower than that in the US (2004 ASR 14.2 and 15.6 respectively) where per capita health care spending is the highest in the world.5,22 Sweden also spends less on health care as a percent of GDP than the US, but maintains a similar mortality rate (2004 ASR 15.6). Given these kinds of exceptions, it is important that not only the total health expenditure but the distribution of that expenditure into effective private or public systems be considered when judging approaches to reducing the burden of breast cancer. The need for global data about genetic and biologic influences on breast cancer is supported by recent small studies in black American women revealing a higher frequency of ER negative and the aggressive "triple-negative" tumors (tumors that don't express ER, progesterone receptor, or the oncogene c-erbB2/HER2) than that among white women.23,27-29 In white women, such tumors are associated with inherited mutations in the breast-cancer gene BRCA1, and genetic determinants in African women may predispose them to high-risk tumors. Although cancer-predisposing BRCA1 and BRCA2 founder mutations occur at high frequencies in various populations (such as Ashkenazi Jews), significant differences in mutation rates between races have not been demonstrated. However, there appear to be differences in the spectrum of BRCA-1 and BRCA-2 mutations, as well as the rates of BRCA variants of unknown significance between Caucasian, African and Asian women.30-33 Although there are currently not enough data to assess how these differences in inherited mutations might explain differences in incidence and mortality, there is a growing need to elucidate the genetic and biologic contributions to breast-cancer risk for women of all racial and ethnic backgrounds. It is clear that breast cancer will be an increasing burden in many countries and there will have to be a redirection of health resources to diagnose, treat and monitor the growing numbers of women who are affected by the disease. This will take political will, reliable data and cancer registries, public and medical community awareness, and partnerships between advocates, government, foundations and NGOs, and biotechnology companies. These partnerships can provide the incentives and the means to make crucial advances in lowering the unacceptable burden of mortality in lower resource countries. 3. Curado M, Edwards B, Shin H, Storm H, Ferlay J, Heanue M, et al., editors. Cancer incidence in five continents, vol. IX. Lyon, France: IARC, 2007. 32. Olopade O, Fackenthal J, Dunston G, Tainsky M, Collins F, Whitfield-Broome C. Breast cancer genetics in African Americans. Cancer 2003;97(1 Suppl):236-245.